This outfit was pretty spot on for a lazy Sunday brunch – tapered harem pants in a subdued midnight blue paired with a slouchy cotton top with moody purples, violets and blue florals bleeding into each other. Simple, nonchalent – just what I aimed for. I finished it with my parent pinky red wedges which demand attention with their cut out detail to give it a little pop of colour. However, when I shrugged on my signature winter coat and the obligatory ‘It’s Sunday and far too early to be leaving the house’ sunglasses, my perfect laidback outfit went from effortless to LA starlet obnoxious before I knew it. I kind of like the look but even I have to admit that this was a tad OTT. I heeded Coco Chanel’s advice on accessories – ‘Take one accessory off before you leave the house’ and took my obnoxiousity down by a notch. It was Sunday after all! 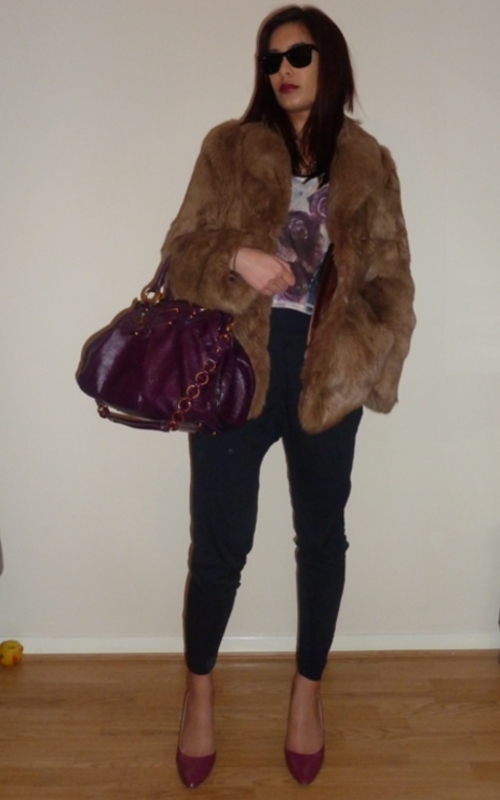 Well, I think you look fabulous and that coat looks sooooo cosy Reena!